Residential Wave Slides for 4ft or 5ft deck heights. Slides are molded from polyethylene structural foam. The 4ft wave slide comes out away from fort about 7ft. The 5ft deck height slide comes out away from the fort about 8ft. Both are easily installed on your Wooden Swing Set or Fort. Available in yellow, blue, or green. There is a surcharge for shipping to Rocky states and westward. 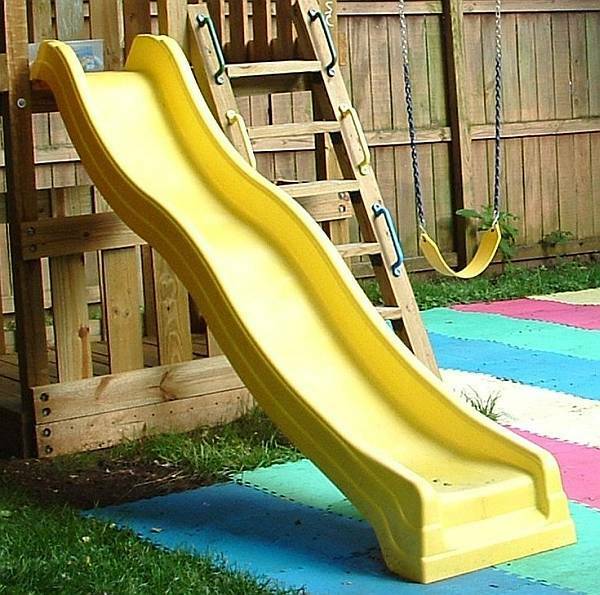 Plastic slides are preferred over metal slides for most play equipment, due to their lower thermo dynamics and heat transfer properties. Plastic slides may still become as hot as metal, they insulate better and do not transfer the heat as quickly. Because of these properties, the Consumer Product Safety Commission (CPSC) recommends plastic slides and plastic surfaces over bare metal. IMPORTANT: Please read for important information. In this material we have tried to provide some requirements stated in the CPSC Handbooks, ASTM F2373-11, F1487-11 and F1148-09. However, we in no way intend for this to be a complete list of requirements. Also these publications are updated frequently with changes therefore, you should read these publications yourself to determine if any part or installation could prove a danger to a child. All slide are tested for lead, phthalates and tensile strength. For more information or view CPSC Playground Safety Handbook. Available in Yellow, Blue, or Green.